The McDonald family sat down to share about generosity and why they invest in the families at Gracewood. Here’s a part of that conversation with Todd McDonald. How did your family choose Gracewood to invest in? We look at our giving the same way we look at business. God gives us a finite amount of resources. Like the parable of the talents, we should make the most of what has been given to us. We see that Gracewood gives the greatest return to the Kingdom of God. As a family, we give to solve problems. You identify the problem and then determine the best way to solve it. We support the cause of Gracewood because you solve problems. How did philanthropy become a family decision? We were raised to experience the benefits of being faithful with a little and then receiving much. We were not only expected to make money, but to make sure we knew how to give it away. My brothers and I knew from the beginning that generosity and wise financial stewardship were what God expected from us. Our parents made sure of that. What influenced your decision to be more involved and make a financial investment in the new campus that Gracewood is building? Gracewood’s approach is different. The goal is to meet the underlying needs for each family rather than put a BAND-AID on it. Your impact is generational, a greater value because of the triangle effect it creates. With each generation, more lives are changed. Others meet symptoms. Gracewood solves problems. Todd, you said generational impact means a lot. Would you share a little about your daughter Cora and the generational impact she is having? Cora’s life has touched more people than I can count. So far she has impacted people on 5 continents and 20+ countries. 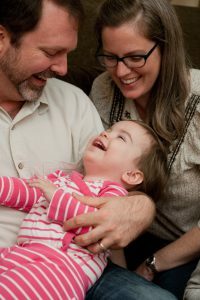 When she was diagnosed with Tay-Sachs disease, we learned her life on earth may be shorter. So my wife, Holly, and I saw a greater purpose for Cora and us. Our family purpose became to build meaning and bless others through Cora’s life. For her first birthday, we did a book drive. People gave books that we donated to Houston Hospice. For her 2nd birthday, the theme was acts of kindness. Last year was school supplies for children. I can now tell you what 4,200 stacks of Post-it® notes looks like in person. Even though Cora passed away on May 23, 2017, the acts of kindness carry on. Every year, our family is going to continue this tradition of blessing others on her birthday. Cora’s legacy will continue to inspire countless acts of service and kindness. What else would you like others to know? Our number one goal was that Cora would never be in pain. The message behind all of this was education for pre-genetic screening so people have information to make informed decisions. Cora’s life was short, but complete. We wanted to establish her legacy: that’s where Cora and Gracewood intersect. Gracewood is all about legacy. Legacy is the goal. What would you say to someone who is thinking about donating to Gracewood? What we give is not a gift. It is an investment. And it’s a duty to extend what we have to help others. For us, the McDonald family, the end measurement is changed lives. People everywhere want to do good for others. What they often need is that lever to move them. We are still seeing God use Cora to be that lever for thousands of people. Our job is to do the best that we can. And let God use our best for His purpose.